“On February 8, a health centre in Mishmishan in northwestern Syria’s Idlib region was hit by an airstrike. This is another step towards disaster in this troubled zone. Once again, this bombing is completely outrageous and cannot be tolerated. It is a sad but undeniable fact that civilian areas – specifically healthcare facilities - are being hit in northwestern Syria, and the strikes – despite their regularity during the seven years long conflict - are currently at an intensity that should be a landmark, another wake-up call. In Mishmishan, MSF was supporting the vaccination activities of the health centre. In the second half of 2017, that team vaccinated more than 10,000 children. This service is now shattered. The area in the health centre where the vaccination activity took place was badly damaged, destroying the stock of vaccines and the fridges required to keep the vaccines cold. Given the massive numbers of families fleeing to this area from the conflict raging further south and east, there were many vulnerable displaced people who did not necessarily know about the vaccination services in the health centre, or who just assumed that in this time of war vaccination was not something they could expect to find, or who knew about the service but were afraid to move and seek it in health centers such as Mishmishan. That is why MSF supported that vaccination team to start some outreach activities. 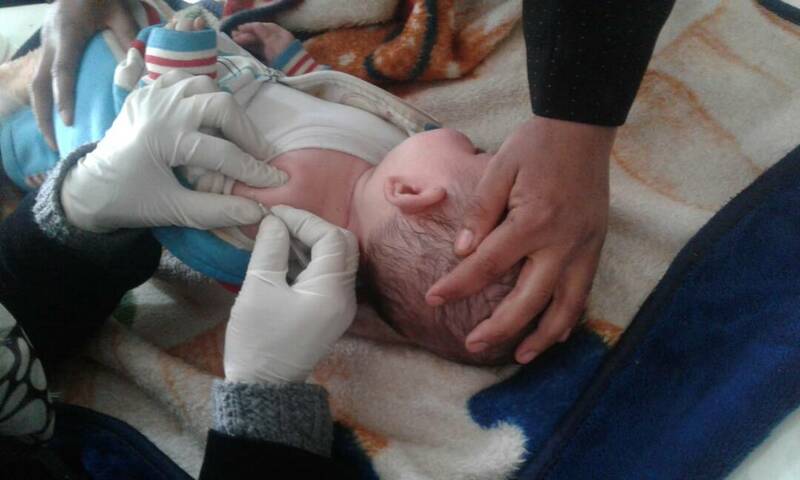 The morning the health centre was bombed, the vaccination team was out in nearby villages. Their lives, and the lives of parents and children who would have been queuing for vaccinations at the health centre, may have been saved by that lucky coincidence. That is no consolation for the six people killed by the strike, all patients or caretakers of patients. And it is no consolation for the 17 people wounded, among them three medics from the health centre. We send our deepest condolences to the friends and families of those killed, and we wish a safe recovery to those who were wounded. This situation also raises the question of where the wounded will be treated. There is a terrible knock-on effect each time a medical facility is bombed. For example, the reference hospital nearby at Qunaya, to which MSF is providing a comprehensive package of support, was made extremely and understandably nervous by what happened at Mishmishan. In order to minimise the exposure of medics and patients in case they too would be bombed, the Qunaya hospital management reduced services, sent non-critical patients home, and kept a skeleton team running the Emergency Room and the operating theatre, but nothing else for the moment. This domino effect ripples out in waves each time there is a strike on a hospital or clinic. The result is more people in greater need with fewer health services open and available. The circle is certainly vicious. Those facilities that remain open are so overwhelmed that consultations are rushed, errors in diagnosis can more easily be made, referral options for more critical cases are harder to arrange, or may be impossible. And so more people become more seriously sick and have a greater need for more advanced medical care, which is becoming ever more constrained. Our mobile clinic teams see this as they move around the settlements of displaced families, sheltering in the cold, crowded into tents, sometimes having travelled dozens of miles barefoot to get away from fighting or the threat of bombing. Among the most prevalent medical needs are respiratory tract infections and chronic diseases, such as diabetes and hypertension. Without access to care these conditions can worsen, in the case of chronic diseases becoming eventually life-threatening. The MSF mobile clinic team can treat the patients they find, but there are hundreds of thousands of displaced people spread across northern Idlib and not all people can get to see a doctor or nurse. In the south of Idlib governorate Syrian government forces and their allies are engaged in intense fighting against armed opposition groups. Behind the frontlines, in central and northern Idlib, aerial bombing is hitting civilian infrastructure including medical facilities, deepening the crisis for people who fled as the fighting approached their towns and villages. Since December last year, tens of thousands of families have been trying to find space among the hundreds of thousands of displaced people already crowded into northern Idlib governorate. Many have no tents and are trying to squeeze in with other families and, frightened and cold, people’s health is deteriorating.